October is the tenth month of the year in the Julian and Gregorian Calendars and the sixth of seven months to have a length of 31 days. The eighth month in the old Roman calendar, October retained its name (from the Latin ôctō meaning "eight") after January and February were inserted into the calendar that had originally been created by the Romans. October is commonly associated with the season of autumn in the Northern hemisphere and with spring in the Southern hemisphere. The month of October in the Orthodox Church is perhaps the least uneventful as far as great festivals and themes in the calendar are concerned. Nothing related to the life of our Lord Jesus Christ or the Theotokos is celebrated in the month of October. There are some themes as far as the Saints are concerned, but these are mostly regional in nature. For example, the Greek cities of Athens and Thessaloniki are featured in the month of October by celebrating some of its early and great Saints. Perhaps the biggest festival in the month of October is celebrated on October 1st by most Orthodox Christians, which is the feast of the Protection of the Theotokos. We begin the month of October with a feast that celebrates an attribute of the Most Holy Theotokos - her protection or covering. The feast of the Holy Protection of the Theotokos began after a revelation of the Mother of God to Saint Andrew the Fool for Christ in the Blachernae Church of Constantinople, when he saw her covering with her robe the faithful that were attending a vigil there. From this vision came a feast much celebrated by Orthodox Christians. However, on 21 October 1952 this feast was transferred by the Holy Synod of the Church of Greece to October 28th, to coincide with the national celebration of OHI Day, which also celebrates the saving protection of the Mother of God over the Greek people and nation. The rest of the Orthodox Church still celebrates the feast on October 1st. In this way we can say that in the month of October, from beginning to end, we celebrate the Holy Protection of the Theotokos. It should be noted also that in Slavic Churches Saint Andrew the Fool for Christ is celebrated the next day on October 2nd, while he is celebrated on May 28th by the Greek Churches. The first theme we encounter in the month of October is on October 3rd. This theme centers around the conversion of the city of Athens to Christianity by the Apostle Paul. Therefore on October 3rd we celebrate two individuals who heard the Apostle Paul preach on Mars Hill, and were among the first fruits of the city to believe in the gospel - Saints Dionysius the Areopagite and Damaris. Though Saint Damaris was added much later to the calendar, it is relevant to celebrate her with Saint Dionysius. The theme however continues the next day, when we celebrate Saint Hierotheos, who is considered the first Bishop of Athens, though it is debated whether or not he was the first Bishop of Athens or Saint Dionysius was. A second theme we encounter in the month of October falls on October 18th. This theme centers around the person of the Apostle Luke the Evangelist. Beginning in late September and October the Sunday Gospel readings of the Divine Liturgy are taken from the Gospel of Luke, and it is perhaps due to this that we celebrate the Apostle Luke himself in the middle of October on the 18th. The third theme we encounter in the month of October is on October 26th. This theme centers around the patron saint of the city of Thessaloniki - Saint Demetrios the Myrrhgusher. In Thessaloniki his feast is so popular that they even celebrate the Holy Week of Saint Demetrios leading up to his feast on October 26th. And his feast continues even after when on October 27th we also celebrate the friend of Saint Demetrios who was martyred before him, Saint Nestor. In the person of Saint Demetrios, Thessaloniki and the Orthodox world with her celebrates one of its greatest and most beloved Saints. Besides these few themes that we celebrate in the month of October, we also celebrate many great and beloved saints of the Church, such as Saints Cyprian and Justina (Oct. 2), Thomas the Apostle (Oct. 6), Sergios and Bacchos (Oct. 7), Pelagia the Repentant (Oct. 8), James the son of Alphaeus (Oct. 9), Philip the Deacon and Apostle (Oct. 11), Longinus the Centurion Oct. 16), Hosea the Prophet (Oct. 17), Joel the Prophet (Oct. 19), James the Brother of God (Oct. 23) and Anastasia the Roman (Oct. 29. We even celebrate the Fathers of the Seventh Ecumenical Synod on the Sunday that falls between October 11 and 17. 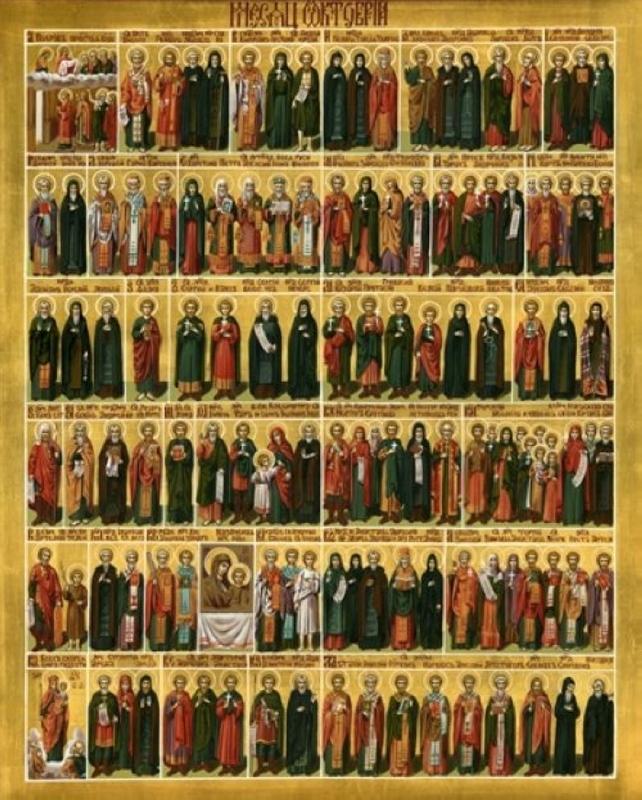 Though we do not celebrate any major events associated with the life of our Lord or the Theotokos, the month of October in the Orthodox Church still offers us saints on a daily basis to celebrate, some more known to us than others. 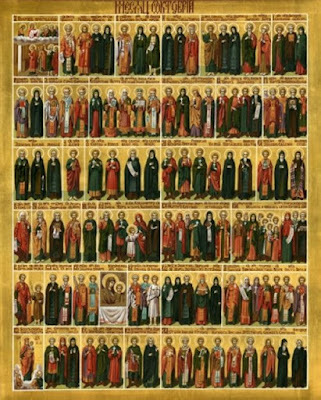 This should present a challenge to us to get to know also those saints we do not know as much and acquaint ourselves with them, to make the month of October just as celebratory as the rest of the Christian year.